We don't always think of SAP as an innovator. But they are doing a lot. Complex Event Processing based on real-time sensor data, social media to find the right skilled people, embedded analytics, and mobile platforms are just some of the innovations coming out of SAP these days. Part One of this article talked about SAP’s foray into SaaS, Rapid Deployment Solutions, agile development at SAP, and their new HANA platform for in-memory database applications. But there was more thing that I learned while attending SAP’s Influencer’s Summit. The picture was one of a vibrant company that is not shackled by its heritage. Real-time Visibility – Where’s My Train? AP took the Complex Event Processing they inherited from Sybase and integrated it into BusinessObjects Event Insight, a system for collecting, filtering, aggregating, propagating, and publishing business events. 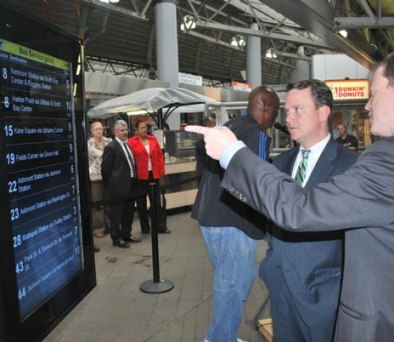 They demonstrated a system that one of SAP’s railroad clients uses to track trains. They added sensors and tags to engines and rail cars to capture events in real time, and display them on a geographic map showing exactly where the trains currently were on the tracks. This allows precise real-time location of all trains, with all the information about them, which can include things like temperature monitoring in refrigerator cars to make sure the proper temperature has been maintained. The real-time tracking of trains and their cargo enables more dynamic and efficient planning of trains and routes, more precise estimates of arrival times, more efficient allocation of assets, and many other things. SAP’s StreamWork is an enterprise collaboration environment for the purpose of making decisions – involving people so you can get the expertise you need. It has what I would describe as ‘parametric search for people’ integrated into the platform. Someone can pose a query like, “I need someone who is A) a software developer with X level of experience, B) knows networking, and C) is available in X timeframe.” What is returned is a Linked-in-like graph of who those people are and how they are connected to you. It also has knowledge of enterprise relationships, like who those people report to. This shows the progression of integration of BusinessObjects into the rest of SAP’s suite. Three years ago BusinessObjects augmented the SAP business applications – running side-by-side. Then about a year and a half ago, there was tighter integration for key areas like supply chain performance management, configurable based on the user’s role. With BusinessObjects 4.0, there are now embedded analytics, where dashboards and other analytics are embedded right into various workflows, like a dashboard in Demand Planning. With the acquisition of Sybase, mobile has become a fundamental element in SAP’s strategy. SAP may be one of the key companies to bring sorely needed security and other features to the mobile environment. The Sybase mobile SDK is meant to abstract out the phones to provide security features (data kill/protect), synchronization, provisioning, and lifecycle management (e.g. decommissioning). On top of that, they also allow pushing content into phone-specific SDKs to customize the look and feel for each platform. One SAP executive mentioned that the supply chain group from a major telecommunications company was shown an SAP application that aggregated data from suppliers (e.g. via .CSV [comma separated values] files or web) into SAP’s backend, and an SAP mobile application that automatically pulled that data out onto the phone. They asked, “When can we get this mobile app?” The answer was right now—here you can download it from iTunes for 99 cents. In addition, demo versions of many SAP mobile apps are downloadable from iTunes for free. So what did I hear about at the Influencer’s Summit? 90 day implementations of SAP Business Suite components at a fixed price. A true SaaS offering that is starting to take off. Agile development with 6-8 week release cycles for parts of SAP’s suite. Serious integration capabilities for heterogeneous non-SAP backend systems. A blindingly fast and scalable innovative new analytics platform. Real-time tracking of supply chain assets and conditions. Social media for the enterprise. And SAP mobile applications downloadable from iTunes for a buck. This sure is different than the SAP I first encountered in the early 90s. This transformation is still a work-in-progress. It is hard and takes time to change an enterprise as large as SAP. And that transformation never really is over. But from what I’ve seen, SAP has come a long way, made some very smart acquisitions, and put in motion a lot of innovative initiatives that will help them remain a powerful competitor and force in the marketplace for a long time to come.